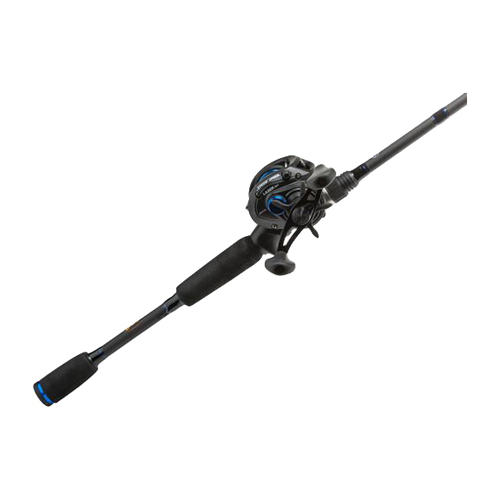 The Lew's American Hero Baitcasting Combos come equipped with a Lew's 5 premium double shielded stainless ball bearing Speed Spool baitcast reel with Magnetic Control System cast control. The reels have a 1 piece lightweight graphite composite frame and side plates. The spools are machine forged aluminum and anodized blue. Their main gear and crankshaft are high-strength solid brass. They have a palming side plate that can be quickly released and removed for easy spool access. A durable Rulon drag system provides up to 10 pounds of drag power. The rod in the combos are premium 1 piece IM6 graphite blanks equipped with stainless steel guide and inserts. The reel seat is skeletal and has a cushioned hood. These rods also feature EVA split grip handles that are lightweight and slip resistant. Lew's patented "No Foul" hook keeper never interferes with casts and retrieves.